Oklahoma Gov. Mary Fallin talks about the state's response to the drought during a news conference Monday in Oklahoma City. At right is state Emergency Management Director Albert Ashwood. At the Lake Hefner Water Treatment Plant, manager Doug Holmes says the triple-digit temperatures have pushed demand for water to peak levels. "It's not necessarily been much of a call for water; it's just been more water over an extended period of time," Holmes says. "Normally, we're flowing at our maximum capacity for a couple of weeks; this time it's been about a month, month and a half." In the past six weeks, the city's water utility has fixed 1,400 water main breaks and leaks. The high temperature dries the soil and shrinks it away from the buried pipes. Increased water usage raises pressure inside the lines and makes the decades-old pipes susceptible to burst. "While some people are watering their yards, there may be fellow citizens at the edge of the city that don't have enough water pressure to even take a bath," says Debbie Ragan, a city water spokeswoman. Across the state, the lack of water has even cut into tourism. Low water levels in northeast Oklahoma's Grand Lake resulted in a spike of toxic levels of blue-green algae. Gov. Mary Fallin says this hit just as visitors were arriving for July 4 celebrations. "It took a toll on businesses and tourism at the lake itself," Fallin says. "Some of the businesses I talked to at Grand Lake told me they saw a 50 percent drop in the number of people who were coming into their businesses." At least 16 people have died from the heat. The tinder-dry conditions have also sparked wildfires across the state that have destroyed more than 150 structures and burned more than 250 million acres. Climatologists say the drought in Oklahoma might not end until fall or possibly even later. Copyright 2014 KOSU-FM. To see more, visit http://www.kosu.org. It's not necessarily been much more of a call for water. It's just been more water over an extended period of time. So normally we're flowing at our maximum capacity for a couple of weeks this time, you know, it's been about a month, month and a half, so, this time of year. CROSS: And that's caused other problems. In the last six weeks, the city's water utility has fixed 1,400 water main breaks and leaks. The high temperature dries the soil and shrinks it away from the buried pipes. Increased water usage also raises pressure inside the lines and makes the decades-old pipes susceptible to burst. OKC Water spokeswoman Debbie Ragan says some customers are even seeing a big decrease in water pressure. Ms. DEBBIE RAGAN (Spokeswoman, Oklahoma City Utilities): While some people are watering their yards, there may be fellow citizens at the edge of the city that don't have enough water pressure to even take a bath. CROSS: Across the state, the lack of water has even cut into tourism. Low water levels in northeast Oklahoma's Grand Lake resulted in a spike of toxic levels of blue-green algae. Governor Mary Fallin says this hit just as visitors were coming in for the fourth of July. 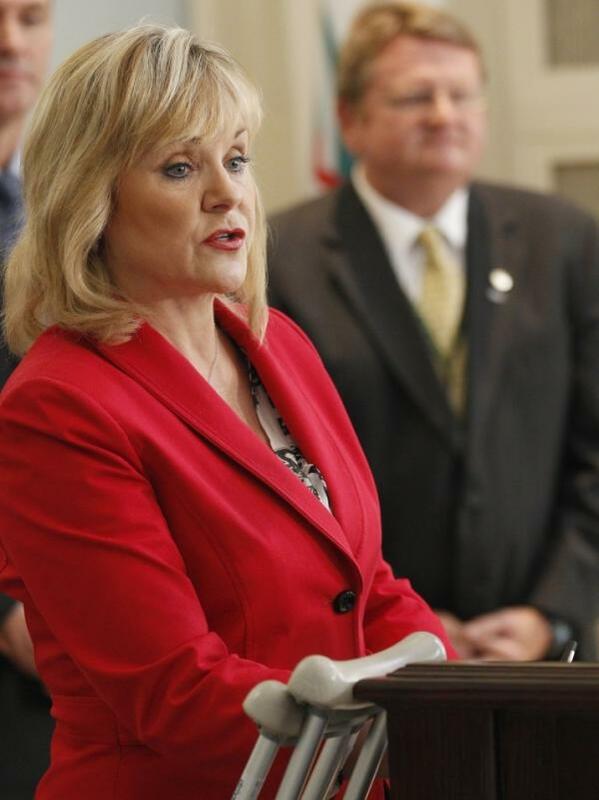 Governor MARY FALLIN (Republican, Oklahoma): It took a toll on businesses and tourism at the lake itself. Some of the businesses I talked to at Grand Lake told me they saw a 50 percent drop in the number of people who were coming into their businesses. CROSS: At least 16 people have died from the heat. The tinder-dry conditions have also sparked wildfires across the state which have destroyed more than 150 structures and burned more than a quarter-million acres. Climatologists say the drought in Oklahoma might not come to an end until fall or maybe later. For NPR News, I'm Michael Cross in Oklahoma City. Transcript provided by NPR, Copyright NPR.